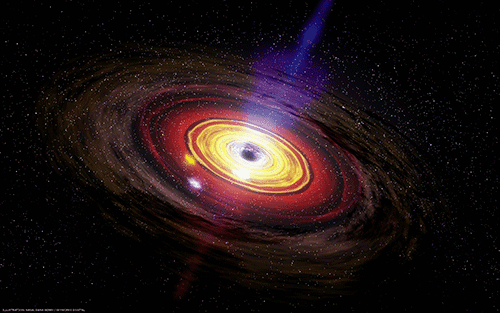 ‘Quasi-Periodic Oscillations (QPOs) of the hot plasma spots or clumps orbiting an accreting black hole contain information on the black hole mass and spin. where [itex]\rho^2=r^2+a^2 \cos^2 \theta[/itex] and [itex]\Delta=r^2 – 2Mr + a^2[/itex]. [itex]\tau[/itex] is proper (or local) time, s is spacetime and t is coordinate (or at infinity) time, M is the gravitational radius (a geometric unit for mass) where M=Gm/c² and a is the spin parameter (a geometric unit of spin) where a=J/mc. where ϖ is often referred to as the reduced circumference (or the proper coordinate radius that takes into account frame dragging). where + defines the outer horizon and − defines the inner. The marginally stable orbit is at 6M for a static black hole and reduces the greater the spin is, down to M for a hypothetical maximal black hole where a=M, hence the spin parameter can be deduced from where the marginally stable orbit resides. where rms would be used to calculate Ωθ. In both cases, the spin parameter is calculated to be a/M≈0.65 in order to match the orbit periods (T), as per fig. 8 in the paper. (Note, the equation for T is based on circumference/velocity where circ=2πϖ and v=Ωϖ where ϖ replaces what would normally be r). While there are other signals for QPO’s around the black hole, these are the most significant when calculating the spin, the shortest stable orbit period in x-rays indicating the MSCO (inner edge of the accretion disk) and the shortest period in near infrared which indicates matter falling into the black hole (note, the matter falling locally would be instantaneous but due to the deep gravity well, the matter would appear to make a few orbits of the event horizon in near infrared before shifting deeper into radio waves). The results also corresponds with the estimate of a≃0 − 0.6, from the millimeter VLBI observations of Sgr A*.